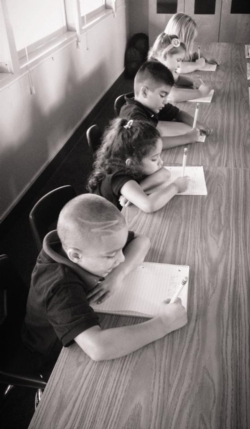 Writing helps students read, solve problems and understand concepts in every part of the curriculum. The National Writing Project (NWP) prepares teachers in strategies that help their students become accomplished writers and learners. Research studies consistently show statistically significant gains in writing performance among students whose teachers participate in NWP programs. The teaching staff of SDGVA collaborates with the San Diego Area Writing Project, a local writing project site of NWP, to develop practices that will help all students succeed at high levels. San Diego Global Vision Academy students will acquire writing skills essential for participation in the workplace and global economy. Lev Vygotsky proposed a theory called the zones of development wherein every child has a cognitive zone of actual development and a zone of proximal development. Vygotsky argued that educators can teach students something new only when the task is within their zone of proximal development. He believed that all learning must proceed from the concrete to the abstract, from the visible and external to the internal. He also believed that almost any child can and will learn if given the right opportunities and instruction. At SDGVA we emphasize a mentor text inquiry approach to writing instruction that corresponds to our students zone of proximal development. A mentor text is any piece of writing that can be used to teach a writer about some aspect of writer’s craft. Mentor texts can take the form of any genre: picture book, excerpt from a chapter book, a magazine or newspaper article, an editorial, a cookbook, etc. Mentor texts are relatively short pieces of text work but may also pertain to digital texts, infographics and visual representations. A mentor text simply refers to any quality writing that is used to demonstrate a writerly craft to students either during mini-lessons, whole-group settings or one-on-one during writers’ conferences. The best mentor texts are those that can be used numerous times throughout the school year to demonstrate a variety of different purposes and many different craft moves. Idea: the text inspires the writer to create an original idea based on one from the text. Structure: the text presents on organizational structure that the writer tries to emulate using original ideas. Written Craft: the author’s writing style, ways with words, or sentence structure inspires the writer to try out these techniques. As educators we build our mentor text lists and libraries, consciously looking for mentor texts from all three categories that serve our grade level appropriately. When using a mentor text inquiry approach to writing instruction it is important to remember that we are teaching a particular strategy or craft move—we are not teaching the book.